Order a free wedding invitation samples kit and see and feel for yourself why our invitations will be perfect for your special day. The exact samples and designs may vary. If you want a sample of your design with your information contact us for details. We understand that as a bride and groom you have a lot on your plate. We want to make your decision making easier when it comes to wedding invitations. We offer Free Wedding Invitation Samples as a way for you to see and feel the quality of paper and printing. The exact designs you receive may vary. If you want to sample your specific design with your information we can do that as well for only $10. If you end up ordering you will get that $10 back as a credit on your order. We look forward to working with you! The Invitation Maker offers a wider variety of products and the samples you receive are only a small set of products we offer. 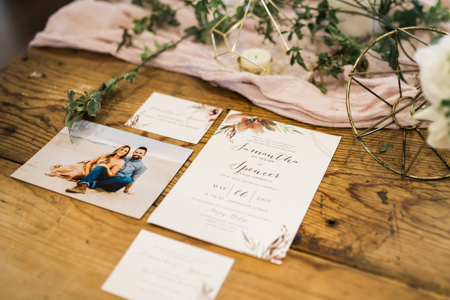 From Wedding Invitations to Save The Dates and more, we can create your perfect wedding invitation suite. If you are interested in Gold Foil, Gate Folded Invitations, Save The Date Magnets, we can do those too! If you don’t see specific pricing on our site just reach out to us on Chat or on our Contact page and we will get you a price quote. At The Invitation Maker, we believe that you shouldn’t have to deal with some online template editor and file formats you’ve never heard of. Our designers will do all the heavy lifting for you and your custom design. Then when you are ready we will send everything to the printer and it will ship out straight to your address of choice. If you want to sample your design before the full order goes to print we can do that for only $10 which we will give you back as a credit when your final order is placed.